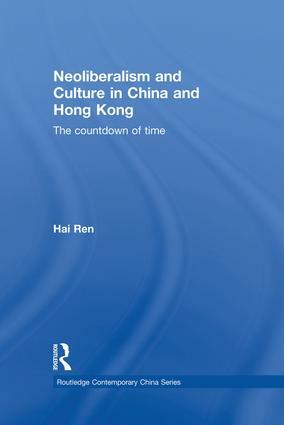 This book examines the period leading up to the Hong Kong handover in 1997 - the 'countdown of time', and by using iconic cultural symbols such as the countdown clock, the Hong Kong Museum exhibitions and cultural heritage sites, argues that China has undergone a transition to neoliberal state, in part through its reunification with Hong Kong. The problem of synchronization with the world, a Chinese phrase that epitomizes China's engagement with modern capitalism since the first Opium War, was characterized throughout the 20th century as a 'humiliation', 'weakness', 'tragedy' and 'disaster', with China in the role of the victim of capitalist globalization. During the reunification with Hong Kong, these conventional expressions were replaced by new ones such as 'de-humiliation', 'return', 'self-esteem' and 'revival'. Hai Ren gives an ethnographic and historical analysis of this cultural and political transformation of China's globalization experience by looking closely at public history practices in mainland China and Hong Kong and how the reconfiguration of everyday life and cultural norms led to the development of this neoliberal China. As a book which straddles Chinese and Hong Kong, history, politics, cultural heritage and museum studies more generally, it can be regarded as a work of cultural political economy which will appeal to students and scholars of all of the above. Introduction: The Role of Reunification with Hong Kong in the Neoliberalization of the Chinese State 1. The Hong Kong Question: From Sovereignty to Government 2. The Affective Economy of the Hong Kong Countdown: Media Convergence, Public Feelings, and Neoliberal Subjectivity 3. History as a Governmental Discourse 4. Morality and Pleasure in the Synchronization with the World 5. The Super Firm in Spatial Representations of Socialism and Capitalism 6. Memories of the Future in Hong Kong Conclusion: Is China Truly Neoliberal, or a State with Neoliberal Characteristics? Hai Ren is Assistant Professor of East Asian Studies and Anthropology at the University of Arizona, USA.